Looking to advance to the next level of of your health? Then you must evolve your health mindset, and to do it right you need a more than just any health coach. Benedick's Wellness Ninja Manifesto will tell you exactly if this is for you. 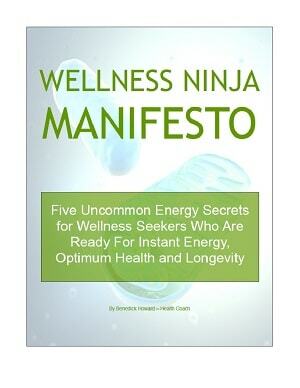 Have you reads the Wellness Ninja Manifesto? Why Benedick's Wellness Ninja Manifesto? Benedick Howard is a health coach and expert in establishing relationships and practicing core coaching skills to assist you in creating the mindset to identify values and desires, transforming them into action, and maintaining lasting change over time. Benedick complements his coaching skills with technologies to greatly speed your journey off the medical treadmill, achieve excellence in other areas by conditioning and disciplining the body, the mind and the heart to get clarity and passion to embrace your life desires. There is a minimum 3 month commitment to facilitate and anchor your new lifestyle. “After all my years innovating new healing technologies and optimizing health strategies I have some secrets that are now fully time tested and ready to change the face of medicine. So, tell me do you wake up after a good night sleep and still feel tired? Do you have cravings that sabotage you from making healthy decisions? Benedick's Health Coaching will be open again soon for enrollment. Read Benedick's Wellness Ninja Manifesto - it is a blueprint of Benedick's Wellness Ninja Health Coaching. obtained with Benedick's coaching. Your results will vary accordingly.